when the form has been filled up to the level of the block, as shown in figure 3-12. From your previous studies, you know that the basic ingredients used in the production of concrete are cement (usually portland cement), water, and both fine and coarse aggregates. You also know that certain admixtures are used occasionally to meet special requirements. The design of a concrete mixture consists of determining the correct amount of each ingredient needed to produce a concrete that has the necessary consistency or workability in the freshly mixed condition and that has desired strength and durability characteristics in the hardened condition. The characteristics of concrete should be considered on a relative basis and in terms of degree of quality required for a given construction project. Figure 3-13 shows some of the properties of good concrete, their interrelationships, and various elements that control the properties. A study of this figure points up the relative basis of the characteristics. A single batch of concrete cannot possess the maximum of strength, durability, and economy. For example, entrained air makes handling easier and is, therefore, conducive to economy; entrained air promotes watertightness; but entrained air makes concrete less dense and thereby reduces the strength. The goal is to achieve an optimum balance of all the elements. A thorough discussion of all the factors involved in the production of good concrete is beyond the scope of this manual. A wealth of information is available to you in government and commercial publications, especiallythe American Concrete Institute (ACI) manuals. The design of or the selection of a mix, the necessity for a trial mix, the methods of controlling the mix proportions, and the units of measure to be used in the batching all depend on the nature and size of the job and the extent to which requirements are set forth in the specifications or on the plans. Figure 3-12. 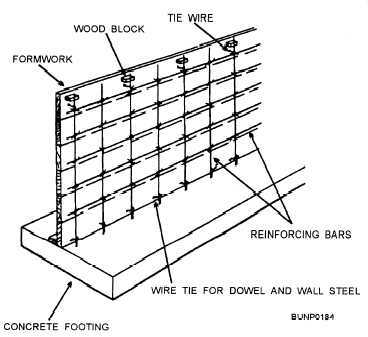 - Steel in place in a wall.